Went pasar malam. Walk half way saw lulian. *Pouting* I want Lulian. I don't wanna let go. Mamarazzi! I want this lulian or else I refuse to go. Yay Yay! I win. I got my Lulian. Yum yum..bitter sweet lulian. Didn't eat enough Lulian during New Year Feast. Right hand hold one, left hand also must hold one. If not Mamarazzi would eat all the Lulian. 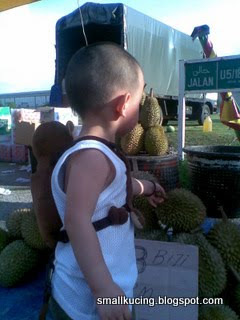 Oh he loves durians! Chloe will run far far away when she sees them haha! There was one periodwhich he doesnt like durian. Now taste changed. Now he loves them pulak. I wun eat durians unless they're all frozen up! U kno... cold cold nicer to eat! Ha ha, just bought some 2 days ago! Nice durians! eat already cannot afford to burp. especially during office hours. I think give the joshua boy one dozen oso he can wallop habis!!!!!!!!!!! I am not really fond of frozen durian as thetend to los some taste after frozen. Thus, I would put into the fridge but not the freezer. Normally habis within 2 days . i rally had a giggle when i read your title in this post..Lulian Lulian,i thought what was that, it is durian .........very creative lah you..
jom... mari pergi makan lulian bersama ah lian. 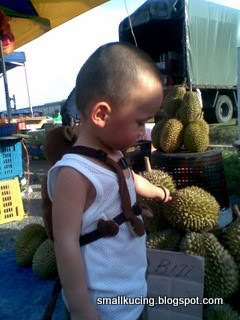 I also saw lots of durians in Seremban area. Must be the season again. But bad weather = sore throat, how to eat la? hubby is craving for it since last week. Are you another durian kaki? Yipee...join the durian gang andjom durian. Huh? ...mind if i ask whether if you are preg? Coz last time I was preg, hubby pulak sibuk craving for fried carrot cake..kakaka. 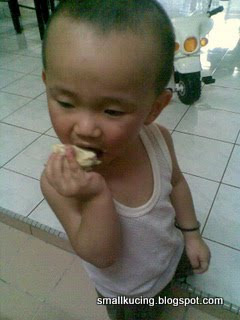 It is fun to see your son exploring, experience and enjoying all sort of food. Thanks for visiting my blog, Jessica. I took a peek at your blog. I really envy your talent on paper cutting. You selling too? 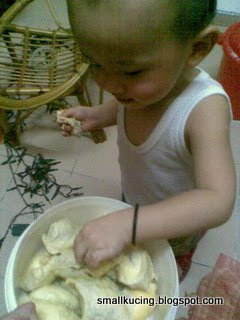 Yup, this budak really "wai sik" kakaka everything also wanna try and eat. About Joshua holding lulian in both his hands, scared Mamarazzi finish everything, this reminds me of Juan Or. I was holding a mini packet of Double Decker prawn crackers. Both of us were eating from the same packet. When the prawn crackers were about to finish, I noticed Juan Or eating faster and faster. hahaha....must be scared I sapu finish! Joshua loves durian? Not many kids love its taste.